This is my first entry for the One Side Project Challenge. Thank you to Samantha Zhang for coming up with this great idea and providing some much needed accountability and a kick in the pants to help move this project along… It’s funny because another app I want to develop is one about creating personal accountability, but we’ll save that for another time. What I do have is the passion to create an application that works hard to help people develop deeper, more intimate and longer-lasting romantic relationships. As an introduction, a ‘loveslice’ is a moment of honest, intimate connection between two people. Everyone I know lives a very busy life (including myself and my fiancé), between work, kids, school, trying to take care of one’s self, trying to take care of others, and the list goes on… Often what doesn’t get the attention it deserves is your relationship. It’s easy to put it aside — “Soon we’ll have time for that.” or “Next year we can take time to really be together.” I did that in the past, and don’t want to do it again. I’ve been lucky enough to find a beautiful woman who loves me… The passion for creating Loveslices has grown out of my love for this woman and the care that I want to administer to our relationship (and she does too, which is fantastic!). 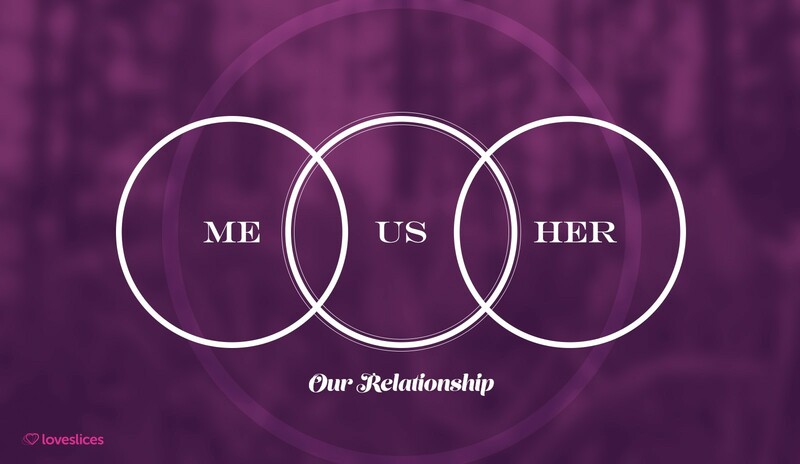 In a relationship between two people there are three entities. In our case it is myself, my fiancé, and our relationship. The circle in the middle needs love, care and attention too. All three of us need care, we all need love, and this is true in any relationship/marriage/romantic partnership. Loveslices is the virtual gardener that helps the two of us tend to our relationship so it can grow in a sustainable and healthy way… What an exciting adventure. But to clarify the list above, this last Sunday I did some writing for loveslices.com — I’m putting together some questions to start engaging the audience and better learn about their needs in the context of love and relationships. So for February my goal is to get V1.0 of loveslices.com up and ready with the survey questions, descriptions and some email capture mechanism. This project has been rolling around in my head, in an Evernote, in some Sketch comps, Photoshop and Illustrator files for a couple of years now. Out of all the ideas I have it’s the one that is foremost in my heart and mind. At Loveslices we want you to have the most fulfilling, loving and rewarding relationship you can possibly have. We call the moments that make up that wonderful, healthy relationship “Loveslices”. We would love for everyone, everywhere to experience multiple loveslices every day. Loveslices.com is a web and mobile application for anyone who wants to experience more love and intimacy in their lives. Please share and recommend 💚 this post if it resonates with you. We’re growing organically and will need your help to get the word out. Thank you! While you’re at it why don’t you follow the One Side Project Challenge also… That way you can get our project updates on the 4th of every month. A web and mobile application designed to facilitate and promote conversation between two people in a loving relationship.